Ravin Lama is the Executive Director of AAPCA Mauritius, which publishes the widely read French daily “LE MATINAL” Ravin has led a colourful life so far and it’s fitting that he and his family now make a home here on our beautifully colourful Mauritius. Ravin’s parents had a love at first site moment that resulted in one of the first inter-caste and interreligion marriages in Kathmandu. Ravin was the second born of three children, in Nepal when it was the only Hindu kingdom in the world. According to legend, his maternal great, great, grandfather, a high ranking official in Imperial China, fled due to unrest and trekked over the mountains and lived in a cave in Pashupatinath, the Hindu Holy of Holies in Kathmandu, where he meditated and healed people. This resulted in local priests complaining to then Rana Prime Minister Jung Bahadur Rana that the Chinese ascetic was practicing black magic. As per the standard punishment, he was buried alive. Three days later, when the place was dug up, he was still hale and hearty and alive. So impressed was Jung Bahadur, that he gave his daughter in marriage and the royal red seal with the title of “Chinia Lama”, vast tracts of land, permission to ride a horse, and charge of Boudhanath. The hereditary title is passed from father to son and today, Ravin’s uncle bears the title of “Chinia Lama”. Ravin’s father was in the Army so they travelled extensively throughout India. Seven of his early years of school were in a boarding convent run by Irish nuns where children were shielded, almost like Puritans. Ravin recalls coming home for winter holidays and seeing his mother’s transistor radio and asking, “From where does the music and song come from?” With a straight face, she said there were little people inside who played and sang. Unable to contain his curiosity he broke open the set to meet the ‘little people’. Alas, there were none. Instead, he got a good spanking. This wasn’t the only time his curiosity got him in trouble as a child! Ravin discovered a talent for writing early on and began selling his writing for pocket money used to feed his insatiable thirst for books and magazines. He worked as Assistant Editor for the monthly magazine “Nepal Review”. Sadly, he never received any pay as the magazine went bankrupt after just eight months but the experience gained was invaluable. for UNICEF and UNDP. He was approached in 2001 to set up a marketing company and this was his segue from advertising into publishing.Ravin launched several successful newspapers and a few are now his competitors. At 33, Ravin met his bride Bhawana and just like his parents, found love at first sight. Soon after they met, she left to pursue a second Master’s Degree in the US but when she returned, he proposed. They have a son, Rishabh, now 13. Ravin, a very social person, has varied hobbies and interests, including being an Edward de Bono Trainer, a Toastmaster, and member of the International Brotherhood of Magicians).He’s also avid in Reiki, Reflexology, Crystals, angels, music, and loves humour. Today, an average day means waking up at 5:30am to see Rishabh off to school and then a traffic battle to get to the Port Louis office where his solid team takes care of the everyday stuff so he can focus on networking, strategic planning, and relationship building. 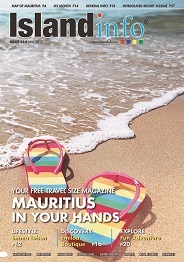 Ravin believes Mauritius is a country with excellent infrastructure. He loves the quality of life, the people, the culture, and the opportunity to continually discover new things. There is beauty, charm and peace here with a positive and vibrant energy. What more could you ask for? “I shall pass through this world but once. Any good, therefore, that I can do or any kindness I can show to any human being, let me do it now. Let me not defer or neglect it, for I shall not pass this way again.” - Stephen Grellet.